With my move to a new city, much of my free time is spent exploring my new home. Nate has lived here for almost 10 years and as familiar as he is with this area, there are a lot of places in our city that I have discovered that he wasn’t aware even existed! One of the first places I wanted to scout out was the area yarn shops. Because it would be a travesty if my husband didn’t know where the yarn is! You may recall in previous blogs how much I enjoy the quaintness and feel of a local yarn store. I love to support small businesses, and I will do my best to try to frequent them as often as I can. Fortunately for me, my city has a few in and around the area! Insert a visual of wide-eyed Nadia looking like a kid in a candy store each time she enters one of these shops running around squeezing all the yarn balls! Last week, I popped into one of the local shops, Unwound Artisan Yarn Shop here in La Crosse, WI and found out they were having a Yarn Loop! Squeeee! How did they know I needed that in my life right now? What it entailed was a 200 mile route through three states, hopping from yarn shop to yarn shop along the route. Six shops in total were part of this event! You have no idea that I could hardly sleep the night before!! I was THAT excited. The first thing I did when I found out there was a Yarn Loop was call my mom. Who better to join me on this adventure than my crafty partner in crime?? I was hoping she would be able to come the night before to have a pre-yarn-hop slumber party where we would stay up all night and plot out our plan and get an early start, but she was so busy she couldn’t make it until early that morning. She had over a two hour drive to get to my house, and of course I insisted we be ready to go by 8am. Even though the shops didn’t open til 9! She was at my house by 8am the morning of the yarn hop and by 9 we were walking into the first shop! Our first stop was Unwound located right in Downtown La Crosse. I love their shop and how welcoming the staff is! The minute you walk in is a burst of warmth and color. Here we were given our “passport” to have stamped at each of the shops participating. Each shop was giving away some door prize swag, there were great deals and sales on yarn, and some had additional prizes and giveaways. Unwound had a nifty needle measure as their giveaway. I also scored some great purchases. I bought some wonderful yarn by Abacus Dyeworks. Along with fabulous fibers, I found some patches to add to my yarn bag. All in all it was a great start, despite the fact that as soon as we stepped out of the shop it was a torrential downpour! Meh, no rainstorm would dampen my spirit when 5 more shops await! Follow Unwound Artisan Yarn Shop on Facebook!! Check out their Instagram here!! Next was Fitting Knit Shop, another store in downtown La Crosse. We arrived and had our passport stamped first thing. They were giving away free knitting patterns and I grabbed a couple skeins of Bamtastic Bamboo Yarn. I plan on trying my hand at knitting to see how I do. One really special point about this stop was the history of this little yarn store! It was established in 1946! They are still in business today. What a remarkable claim to be able to make! In the days of internet, it is pretty cool to see a business like this survive through so many decades. Follow Fitting Knit Shop on Facebook! We were quickly on our way to Viroqua, WI to Ewetopia Fiber Shop. I love this shop! With wall to wall fiber and lots of fun products that go beyond the yarn, I felt my excitement rising! 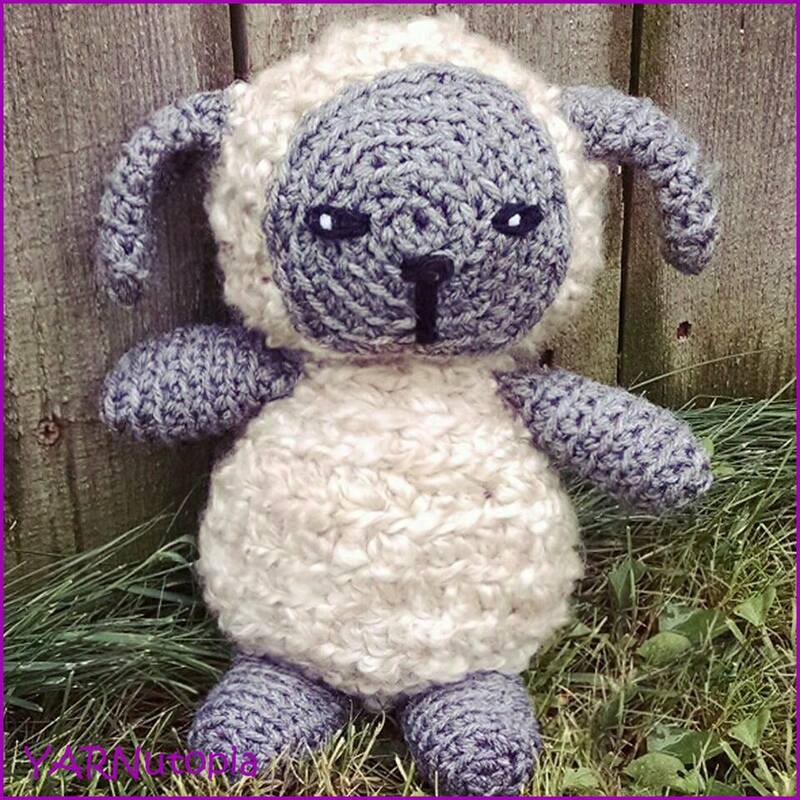 What made Ewetopia stand out was the fact that they farm their own woolly animals that provide them their own AMAZING yarn! You all know me, I had to try THAT yarn! I purchased their own yarn which was 100% Blue Faced Leicester Wool. How incredible to have a sustainable farm to provide your own wool and fibers to their customers as well as stocking additional fabulous fibers! The staff at the shop was so endearing and wonderful. I had my passport stamped and I met some friends along the way! They gave out stitch markers for free, and of course I had to purchase some of the other fun items they had in their shop! I can’t wait to go back! My mom and I were now off to Decorah, Iowa to our fourth stop of the day. By this time it was closing in on lunch, but we decided to wait until we arrived in Decorah, made our stop at the yarn shop Blue Heron Knittery, before stopping for lunch. Oh. My. Gosh! What a wonderful city Decorah is! This was my very first time visiting and right away we noticed the strong Scandinavian heritage of the area! It was wonderful. What was even more delightful is the yarn store had a wonderful selection of yarns that were specific to Norway and Denmark. We marked our passports to make note that we found our way to the fourth place on our route. I picked up some Kauni 100% wool and some Rauma Finullgarn. The shop had some fun swag giveaways and I walked away with a cute notepad with sticky notes and a pen. A cute stash bag also caught my eye and I had to have it! By now we were starving and the Blue Heron Knittery shop staff recommended us to Ede’s Angry Pickle! Yes you read that right! It is a little sandwich shop right across the street a bit from the yarn shop. You can follow them on Facebook here! What a delightful diner! We had artisan sandwiches with fresh lemonade and it hit the spot! We even left a little bit of art behind to commemorate the day! My mom drew Pickle Art for the wall inside the diner which was filled with the art of past patrons. By 3pm, we were on our last leg of the trip headed towards Minnesota. A little tired from all the day’s activity, we were determined to finish the yarn hop. The next stop was Just Stitch It Meisch Upholstery in Caledonia, Minnesota. As soon as we walked in the door, we were greeted by wonderful staff in a small shop inside what looks like a home. It was a combined fabric and fiber shop that was very cozy! They handed us wonderful pouches of swag as a sweet giveaway and had us register for a special giveaway of a bag, magazine and ball of yarn. A few days after the Yarn Loop was over, I received a phone call from this shop that I won their giveaway! They had some wonderful yarn selections and I was able to purchase their pattern selection they had featured which used Schoppel yarns. We wrapped up our visit and were on our way to the LAST stop of the day! Winona, Minnesota was the next city on the map for our fabulous Yarn Loop Day. Yarnology was the last shop and last stop for us! And what a way to end the day!!!!! Yarnology was packed full of fun and fabulous products! I scored myself some Universal Yarns Bamboo Bloom Handpaints in the color Kanji and the swag they gave away was AWESOME!! They handed us gift bags upon arrival filled with lots of fun do-dads! One big highlight of the day was meeting Lisa who is the owner of Abacus Dyeworks! Remember, I bought that yarn from Unwound Artisan Yarn Shop from our first stop?! How awesome was it to meet the dyer of the yarn I purchased earlier in the day!! I also discovered the product SOAK Wash! You can learn more about SOAK and how awesome it is by following them on Facebook here! I absolutely loved this store, the atmosphere, the staff…the list goes on. It was THE PERFECT way to end this hop. My mom and I had such a great adventure as we always do, and a yarn hop was the best way to spend a Friday. We met so many friendly and welcoming people. We enjoyed driving through the countryside, and when the rain cleared, the scenery was breathtaking. We found new places to go back to and explore. A special thank you to all of the participants in this 1st annual Driftless Loop Yarn Shop Hop! It was a blast! And I found out Yarn Hopping is as fun as it is exhausting! Until next year everybody! Share your yarn hop adventures in the comment section! I would love to hear from you! Whenever I read bloggers’ posts about yarn-s/hopping (like it ?) I am filled with jealous rage: even were I to train it up to Melbourne, there’s only one or two yarn shops. Sighh .. But always terrific to read about: sometimes I find small businesses prepared to ship to Oz ! Your enthusiasm is endless Nadia! Thank you for the write up about the Driftless Loop yarn hop. We here at Just Stitch It Meisch Upholstery enjoyed the hop and the chance to meet all of the hoppers. Loved having all of the excited people walking through the door. So glad that you enjoyed the day with your mom. Hopefully we will see you again before next years loop. Until we meet again, happy knitting/crocheting! How very very exciting. I just LOVE all the yarn that you posted. This really really excites me. ESPECIALLY since next year I will be back home there in Wisconsin so I can’t wait to go on this “Yarn Loop”. Here in Southern California we are having our Local Yarn Crawl the 3rd weekend in September I think. Last year is the first year that I went on that crawl. I won’t be going this year because I will be “yarn shopping” in Dublin Ireland the week of September 17th ….for my birthday!! !